FC Halifax Town were held to a disappointing goalless draw at The Shay by bottom-club Braintree. Braintree seemed the ideal opponents for Halifax to round off a positive week in which Scott Quigley joined on loan and Jacob Hanson signed permanently. Quigley came straight into the side for his debut after joining on loan from Blackpool, replacing Ben Tomlinson. But Halifax did not build on the pre-match enthusiasm, producing a frustrating display peppered with too many below-par individual performances. A one-two between Quigley and Matty Kosylo opened up some space for the loanee, but his shot from a tight angle was straight at goalkeeper Ben Killip. Braintree were far better than their lowly status suggested they would be, and had not just come to The Shay to shut up shop. Courtney Richards and Justin Amaluzor saw the best of the away side’s numerous efforts from go close, while the returning Joe Skarz, making his first appearance in almost a month, nearly turned Ricky Gabriel’s cross into his own net. Dayle Southwell had a shot deflected just over from the edge of the area moments after the break from Kosylo’s lay-off. Justin Amaluzor’s excellent strike from range nicked the woodwork as Braintree threatened to take all three points. 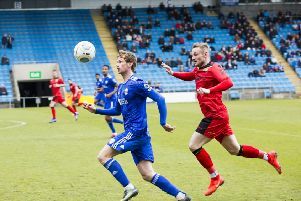 Halifax’s day was summed-up when Ferry’s pass found its way through to Quigley 10 yards out, but the striker failed to control it and the ball rolled dead. FC Halifax Town: Johnson, Hanson, Clarke, Brown, Skarz, Maher, Ferry, Preston, Kosylo, Southwell (Edwards 76), Quigley. Unused substitutes: Rowley, Duckworth, Staunton, Odelusi. Braintree Town: Killip, Eleftheriou, Atkinson, Morton, Amaluzor, Gabriel, James, Allen (Della Verde 81), Richards, Lyons-Foster, Barrington (Rowe 75). Unused substitutes: Borg, Blackmore, Curran.